Verizon on Tuesday introduced the newest Droid and the second from Motorola, but some Android fans may be disappointed to learn that it won’t ship with the latest operating system or the newest Flash Player. 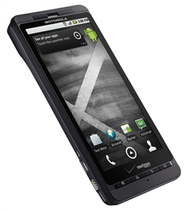 The Droid X will ship with Android 2.1, which will be updated to so-called Froyo, or Android 2.2, later. That means that it initially won’t have Flash Player 10.1, the latest version of that software that became available this week for Android 2.2. Onlookers had hoped the Droid X would come with Android 2.2. The phone will become available on July 15 and will get Android 2.2 and Flash Player 10.1 later in the summer, Verizon said. It will retail for $199 after a $100 rebate. The Droid X doesn’t come with a physical keyboard and will ship with Swype, software that offers a new way of typing on on-screen keyboards without having to lift up the finger. Users will be required to sign up for a $30-per-month data plan for unlimited access. They can opt to pay an additional $20 a month for a hotspot service that lets other devices, like a PC, connect to the phone for Internet access. The hotspot service is limited to 2GB of data usage. Speaking at the event to unveil the phone, Google’s Andy Rubin, vice president of engineering, said that the company is now selling 160,000 Android-powered devices each day and that the Android Market has 65,000 third-party applications. Google CEO Eric Schmidt made a surprise appearance at the event, where he promoted the benefits of Google’s back-end cloud applications on mobile phones. Behind phones like the Droid X are “massively parallel supercomputers that do the computations” for services like voice translation, he said. But he also said that it takes powerful hardware and networks to deliver the capabilities available in such a device.